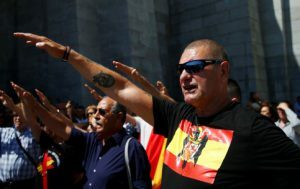 Hundreds of people protested on Sunday against plans to remove dictator Francisco Franco’s remains from ‘El Valle de los Caídos’ (The Valley of the Fallen), a memorial built by the fascist regime to celebrate its victory in the Spanish Civil War. Demonstrators hailed the late dictator, making the fascist salute and chanting his name in front of the basilica where his body is buried. They also shouted against refugees and the Catalan independence movement. Protesters waved flags with Francoist symbols, which were subsequently seized by police officers, as such symbols are banned from being displayed at the memorial. Spain’s new Socialist government recently unveiled plans to transfer Franco’s remains to a different site. ‘I don’t think that a mature and European democracy like ours can have symbols that divide Spaniards,’ said Prime Minister Pedro Sánchez in an interview with El País newspaper. 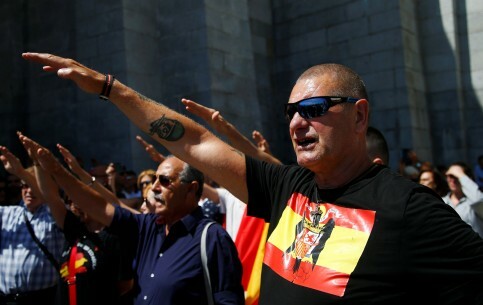 The demonstration was organised by the far-right group, Movimiento por España (Movement for Spain). ‘They aim to profane our leader’s tomb and our sacred monuments, and we won’t tolerate it,’ said the group in a press release. The Spanish Civil War raged from 1936 to 1939, after the then general Francisco Franco led an armed coup against Spain’s short-lived democratic government. The war ended in victory for Franco’s Nationalist forces over the Republicans, who were loyal to the Second Spanish Republic. Franco then took control of Spain and established a dictatorship, which would last until the dictator’s death in 1975.